Greeting cards are a great way to send a warm message of love on almost any occasion. Our Easter greeting cards make it easy for a child to color or paint a hand-crafted card and deliver a biblical message about Jesus and the Easter season all at the same time. 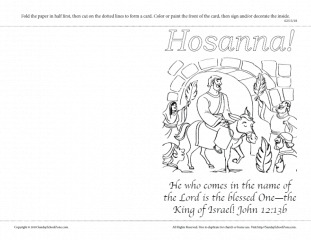 This Palm Sunday greeting card with John 12:13b will remind the child and the recipient that Jesus is the Messiah (the King of Israel) and is worthy of our praise.